Put 6 cups of water in a pot and put in the cubed pork. Boil until meat is cooked through. Add potatoes and simmer for about 30 minutes, or until they are fork tender. Add the other other ingredients and simmer for about 15 to 20 minutes. Add salt and any desired spices to taste. No, not the space aliens flying around Roswell, but rather chile. “Don’t you mean chili?”, you say? No! New Mexico Chile is always spelled with an e. And locals there look down in disdain on what the rest of the country calls chili: Too many beans, too much hamburger, and… cheese? But most offensive is the lack of any “true” chiles. These are of the capsicum pepper variety and grown with religious devotion throughout New Mexico. In fact, New Mexico grows more chiles than any other vegetable, and more chiles than any other state. If you wander into a restaurant that serves local cuisine in New Mexico and ask for chile, you’ll be answered with the question, “Green or red?” Red chiles are the same kind as green chiles, but have been allowed to ripen — and the difference in flavor is pronounced. As for which one is hotter, the debate is ongoing. Of the two I found the green to be hotter. But there are many dissenting opinions! 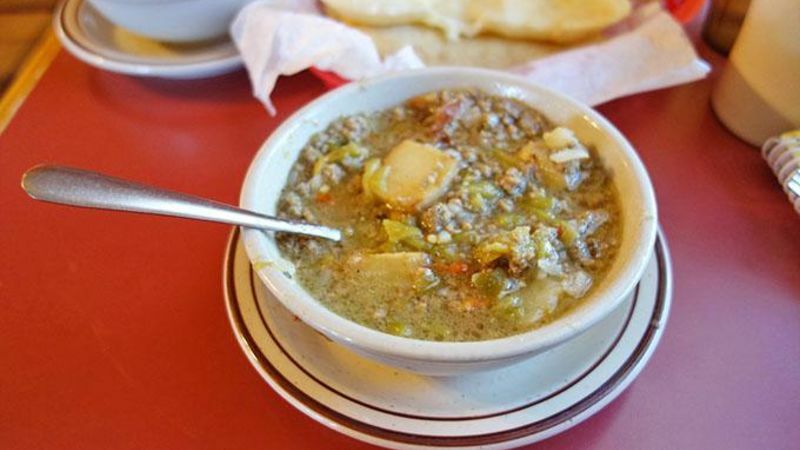 The chiles are included in a great many dishes, from enchiladas to burgers, but what really stands out is green chile stew (or red). Pork and potatoes complement the spicy strong flavors of the chiles. Once you try this dish, you just might look down with contempt on regular old bean and hamburger chili! Unfortunately, it’s difficult to find green (or red) chile stew outside of New Mexico. Which is a great loss for the rest of the country. In my hometown of Minneapolis, the restaurant Brasa serves a passable green “chili” stew, (even though they do spell it with an i), as does The Loon. These attempts are heroic, if not somewhat short of the mark. Naturally, the best chile I’ve had is at Monica’s El Portal in old town Albuquerque. If you ever have the chance, be sure to order a serving of sopaipillas, a kind of fried, unsweetened pastry. Together they make a one-of-a kind meal; the light, fluffy pastry is a perfect compliment to the hotness of the chile. Or you might try to make your own green (or red) chile stew. You may be able to purchase canned chiles locally, or you can always order them from New Mexico. The chile growing harvest is in late summer, but frozen chiles can be ordered anytime. Great places to order: New Mexican Connection and New Mexico Catalog. Yes, when it comes to chile, “e” definitely comes before “i” for me. Try it – I think you’ll feel the same!